This chauffeur driven tour had way too much walking. The driver could have taken us much closer to the Buckingham Palace and the changing of the guard and the good photo spot as advertised did not exist. Also had to walk a very long distance to the Palace and back to the limo!! Also they drove past or drove by too fast for several photo spots. Fairly long walk to the Nelson monument, Westminster Abby, etc. Could not get to see as much because of traffic congestion. A lot of money for what we were able to see in London.. Had to walk more than we wanted because the limo could not get through traffic. Needed more time. Tour guide was knowledgeable, site selection very good. Driver a bit moody but with London traffic who wouldn’t?! Tour seemed thrown together not professional. Car was too small for 4 people making it uncomfortable. Tour guide did a good job despite the rain but not sure had a lot of knowledge about London. Hilary was such a joy! She was knowledgeable, entertaining and fun to be around. The tour was the perfect introduction to London! Highly recommend! Leider war das ein Schuss in die Hose. Erst kam die Reiseleiterin 20 Minuten zu spät, das Fahrzeug war ein PKW auf dessen Rückbank wir uns zu dritt drängeln durften, die Reiseleiterin war zwar sehr nett, hatte aber nur wenig über London zu erzählen, da sie aus Italien stammt und erst seit 2 Jahren in London lebt, ihre Deutschkenntnisse waren auch nur dürftig, was bei einer deutschsprachig gebuchten Tour nicht der Fall sein dürfte. Nach drei Stunden war dann die Tour zu ende. Ok tour but probably would not do it again. nous connaissions mieux Londres qu'elle. L'acceuil entre notre guide et le chauffeur laisse vraiment à désirer. Not a good experience. Driver had poor English skills and first tour guide did not show at all. We spent time traveling to pick up a second guide who turned out to be French! Enough said. Pésima experiencia. La recogida en el hotel fue de parte de la guía y caminando. El 90 del recorrido lo hicimos a pié. Caminamos 15,2 kms en total. Sólo algún traslado con la excusa de escaso tiempo y el tránsito. 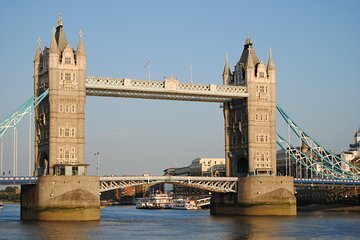 La guía nos dejó en el último punto visitado Torre de Londres. Tuvimos que volver caminando cincuenta minutos hasta nuestro hotel Park Plaza Westminster. Mi primera mala experiencia con Viator. Seguramente deberán reconsiderar al operador local del tour. Solo rescatable la predisposición de la guía aunque no era una profesional del tema. NO RECOMENDABLE.